A wonderfully welcoming place with two hosts that could not do enough to make your stay enjoyable and relaxed. They have great tips for places to visit and see around the Highlands area. We thoroughly enjoyed the afternoon tea and cake each day, along with the many chats with the hosts. Our three day stay went very quickly and was most enjoyable. The hosts had excellent local area knowledge and first rate recommendations on places to eat in the surrounding villages. We would highly recommend Craik Na Dav B&B to all. Ian, Canberra, Australia. We were taking a couple of days to celebrate our “many year” wedding anniversary so only stayed one night , we have a wee dog “Poppy” so it is vital that we go to a place with people that have a genuine liking for animals. It was a delight to find like minded folk in Manda & Lindsey , they are so very warm and welcoming and have a lovely way of making you feel totally at home , it was a super time and really enhanced our anniversary celebration. The house was delightful and had some really nice touches for the visitor . We had a wonderful 6 night stay at Craik Na Dav and can not praise it enough, from the warm welcome with tea and yummy shortbread and fruit cake to the cosy bed and helpful advise we were truly made to feel welcome in Lindsey and Manda’s home and within a short time felt like we were staying with friends. The rooms where warm clean and cosy with everything we needed (including fresh shortbread every day !) Lindsey and Manda were attentive and helpful throughout our stay kindly giving us a lovely bottle of wine for our anniversary and even offering popcorn when we borrowed a film to watch in our room . We ordered a packed lunch on one of the days which was very nice and very good value for money and also the supper with lovely homemade soup. The breakfast was excellent with a wide selection all freshly cooked complemented with yummy homemade jams fresh coffee and fruit, cereals and yogurts all of which was in plentiful supply. The bed and breakfast was situated in an ideal place for taking in the wonderful country side. We had already hired after a long hike a bed in this room and it was terrific. Not only that Manda and Lindsey are incredibly kind and communicative, they have also offered us cakes and cookies! Since they were not sure if we already reserved in the only restaurant of the place, had they gone are extra and have demanded. Breakfast the next morning was the icing. With homemade jam and traditional dishes they were all tastes. Thank you for the great time! We are a Corsican family (with a Teenager and a Baby) and have travelled through Scotland for 2 weeks. We passed 2 nights very quiet in Craik Na Dav. It was one of our best stays. Rooms are perfectly clean and comfortable. Situation of the B&B is ideal to visit LochNess and surroundings ( we went to Eilean Doonan Castle, Uquart Castle, Fort Augustus and Corrimony stone circle…). We had a very nice early morning running in forrest lanes situated just next to the B&B . Most of all Amanda and Lindsey are very kind and attentive hosts, passioned with wild life et with good advice; breakfast was one of our bests (and Lindsey’s jam is delicious!). we met Scottish trekkers and learned how to eat a real good scottish porridge! We are grateful for this good experience. Had a one night stay at the Graik Na Dav and fully intend to go back. Lindsey and Manda are an exceptional team and i just wish all B&Bs in Scotland were like this, from the minute you walk into the house you are made to feel welcome with the offer(and after a long day walking it was music to our ears) of homemade cake and a cuppa, sat with them in their lounge enjoying the view and chatting, never have i felt more at home or welcome. Thanks Manda for the foot spa it was a godsend. Nothing was too much trouble and Lindsey happily booked a meal for us at the local hotel (which was delicious). 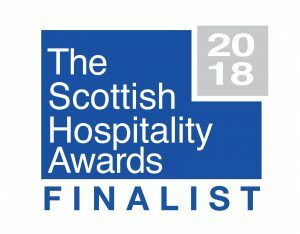 Lovely comfortable room with hot shower and a dram of whisky plus more homemade shortbread and a very eco friendly kettle which we loved. Next morning (after a slightly longer than planned breakfast( loved the mango juice) which certainly sets you up for the walk the next day and a super packed lunch that filled us up at lunch time) we set off with a promise that we would be back. This is a super dog friendly place and the girls three westies are just adorable. To Manda and Lindsey Thank you for providing such a wonderful service and doing it with such obvious enjoyment it was a pleasure to stay at your lovely home and we will certainly be back. We stayed at the Craik Na Dav for one night while walking the Great Glen Way and our only regret was that we couldn’t stay longer. We were lucky in our accomodation throughout our walk – but nowhere else did we feel so much at home, so quickly and so thoroughly. The B & B is perfectly situated for GGW walkers – the way passes the end of the drive, and is only two minutes walk from the local hotel/restaurant and shops (including the “last clog shop before Skye” – which has some excellent leather products). Lindsey and Manda (and their three “boys”) made us welcome from the first moment – with a warm, friendly greeting and an immediate offer of tea/coffee and Lindsey’s homemade cake and shortbread. Over the coffee and cake, Lindsey and Manda gave us the run-down on local places to shop and eat, and even booked a table for us for that evening. (We would recommend the hotel – just in front of the Craik Na Dav – as a good place to eat. And the day we were there was blisteringly-hot so a couple of shandies in the bar were a treat. Our room was well-equipped, spacious and spotlessly-clean (and the mini-decanter containing a couple of drams was as welcome as the coffee and cake). Breakfast the next morning was excellent (including the best kipper of the week) with a good range of choices, accompanied by close-up views of the local birds taking advantage of some of Manda’s many bird-feeders located around the garden (which also contains a relaxing garden-seat, a superb wooden sculpture, and a large and lovely rose-bush). For walkers, this is a perfect B & B. For those travelling by road, there is plenty of off-street parking and the location makes it a good-base for exploring the local area. We would highly recommend the Craik Na Dav, and look forward to staying there again. Paddling the Caledonian Canal respectivly sightseeing the Great Glen we had only one night at Craik na dav, what a pity, because Lindsey, Manda nad “the boys” we´re one of our best hosts troughout three weeks in Scotland! What a warm welcome we received! We felt, that our host were really interessted in us and our Scottish experiences. And the rooms were cosy and had everything you need to recover from a hard tourist´s day, including a “wee dram”! Let´s not forget “the boys”: three absolutly cute Westis, who were allowed to meet the guests, if the guests asked for this favour. Finally the breakfast prepared us perfectly for the next day, and the flowers Lindsey and Manda organised for our 10th wedding anniversary lasted two weeks! Thanks so very much! When we come back to the Great Glen, we´ll definitly come back to Craik na dav! I am not going to repeat all the previous 5 star reviews with which Susan, Paddy the Labradoodle and I all concur wholeheartedly, but we would note that there is “dog tolerant” and “dog friendly” and this was definitely the latter. Amanda even found and dealt with a tick on Paddy which was all part of the service! Staying up until 1215 am drinking a rather nice drop of malt whisky,provided with the tea and coffee making facilities was well rewarded by the appearance of a pine marten. If we don’t stay here again it is only because the world is a very big place to get around in a lifetime but I hope we do return and and cannot recommend highly enough. Best wishes Susan, Ian and Paddy. Stumbled upon this place by accident looking for a cheaper alternative as I was travelling around Scotland by myself. Highly recommend a stay here, rooms beautifully clean . even a wee dram if your no too tired to be bothered after walking all day. I was even treated to a salty foot bath and a pot of tea to ease my throbbing blistered feet..bliss…..
Really over and above for a bnb. lots of wildlife to see and little birds visiting over breakfast we had some baby robins. We had a lovely pitstop here on enroute to the Isle of Skye. Despite us being late Manda and Lindsey could not have been more welcoming. Lots of lively chat over a lovely homely supper with our hosts and other guests. It’s in a perfect location so we were able to set off for a walk to Loch Ness at 10.40pm such was the lightness at this time of year. Walked the GGW over 6 days and stopped at B & B’s along the route. Stayed at Craik Na Dav on night 4 and found Linzi and Manda to be perfect hosts. We received a very warm welcome from the girls who supplied us with a large pot of tea and home made shortbread and cakes on arrival which was well received after a long days walking. The rooms were very comfortable and immaculate and their hospitality even stretched to a dram left in our room. The breakfast was brilliant, all freshly cooked to order. It takes a special type of person to run a B&B and trust me, this place has 2. Their 3 wee Westies are great fun and they even have visits from the local Pine Martin. I will definitely be using this place again. Linda and Davy. Lyndsey and Manda are great hosts, and it feels more like you are friends coming to stay rather than paying customers. Alfie and Holly our dogs were made very welcome and they were able to relax after their hard day on the GGW. 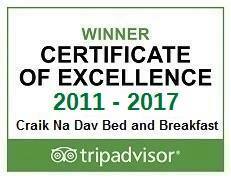 I agree with all the other accolades in other reviews and would highly reccomend Craik Na dav as a first class B&B. Andy & Jane and their dogs Alfie and Holly. We Sue, Joanne, Tony, Had the plesure of having a stop over here While doing the the GGW. This B&B is 5*+. Lindsey & Amanda know how to make you feel welcome even with a little Scottish spirit in your room. The rooms are Beautiful and very comfortable with lovely views from the B&B. Great breakfast, when you arrive they pass you a menu to choose what you want, there was that much on the menu to choose I was not sure how many I was allowed to tick. I enjoyed breakfast with the birds. Lindsy & Amanda enjoy what they do, and take pride what they do. If you want value for your money this is the place to stay.